It was the Historic Churches bike ride day of 2010, and it had started to rain. This didn't bode well, of course, but I was in Great Yarmouth, and didn't know that a few miles inland the villages were bathing in autumn sunshine. I still had memories of the 1995 bike ride I'd completed in near-monsoon conditions. I was leaving St Paul's in Great Yarmouth's Newtown suburb, and the logical next stop was St Mary, so I pelted down Great Yarmouth's long, straight and aptly-named Nelson Road as the rain intensified. I turned into the pedestrian precinct of Regent Road and hurriedly locked my bike up against the fence. Here, tightly hemmed in among Yarmouth's jauntiest tat shops, is St Mary, its great west tower lifting familiarly above the aisles, clerestory, nave and chancel. 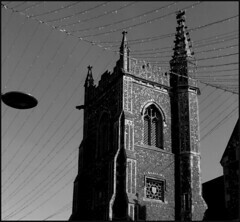 The shape and setting is typical of small-town East Anglia - the Perpendicular self-confidence of the late medieval Anglican parish churches of old England. Except that St Mary is, in fact, a Catholic church, and the building is of course wholly Victorian. As I arrived, Mass was just beginning, which seemed at the very least a good excuse to sit out of the rain for half an hour or so, and who knows? it might even lift me for my onward journey. There were about a dozen people in the congregation, fairly typical for a Saturday morning Mass I imagine, but the curiosity was that St Mary feels a lot inside like it looks outside, a typical CofE medieval church. It did seem strange to be sitting there listening to the English Mass in such a space. As it turned out, St Mary wasn't actually taking part in the Historic Churches bike ride, but they were taking part in Open Heritage weekend, so they were quite happy for me to potter about after Mass taking photographs while everybody else busied themselves dusting, hoovering, polishing and sweeping - it seemed that just about everybody who had attended Mass had a job to do. The atmosphere inside the church is of a dignified grandeur, and one of the main reasons is the interesting range of glass, ranging from the 1850s up to the late 20th Century. A sequence of uncharacteristically good glass by Mayer & Company depicts pairs of Saints. A Geoffrey Webb window depicts scenes from the life of Christ, and a glorious Annunciation window in what appears to be the Kempe & Co style is probably by Hardman. The two aisles end in chapels, and it is in the Blessed Virgin Mary chapel at the east end of the south aisle that you'll find the Annunciation window. The chapel at the east end of the north aisle contains the Sacred heart altar, and a great curiosity, a figure brass to an earlier Priest of the parish. St Mary was built in the late 1840s to the designs of the local architect JJ Scholes, who had recently suffered the embarrassment of his suspension bridge across the Bure collapsing. A crowd had gathered on it to watch a Norwich-based clown float down the river in a barrel pulled by geese (I kid you not). The crowd on the bridge rushed from one side to the other as the clown passed beneath, and the sudden transference of weight caused the bridge cables to snap and deposit the watchers in the river. It was never known how many people died, because the strong current must have washed some of them out to sea. About seventy bodies were recovered, most of them children. A gravestone outside the south transept of nearby St Nicholas remembers one of them in rather spectacular fashion. The accident doesn't seem to have put Scholes off, or the commissioners of St Mary for that matter, and in fairness to the architect it was found that the contractors had built the bridge wider than Scholes had specified as a safe limit. And St Mary is still standing these 160-odd years later, of course. As you leave, you'll spot the most modern window in the church, in the north aisle. 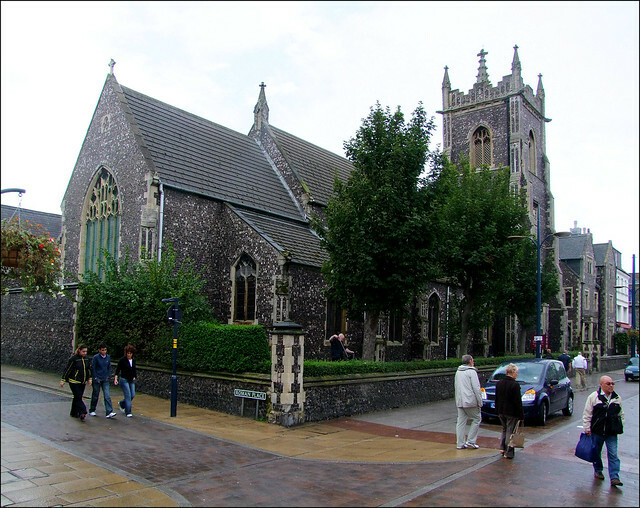 It depicts Mary appearing to St Bernadette at Lourdes, an event which hadn't even occured when this church of St Mary first opened its doors to Great Yarmouth's poor Catholics, many of them probably Scottish herring girls of about the same age as Bernadette.